How do I add Tags to a question on my waiver? 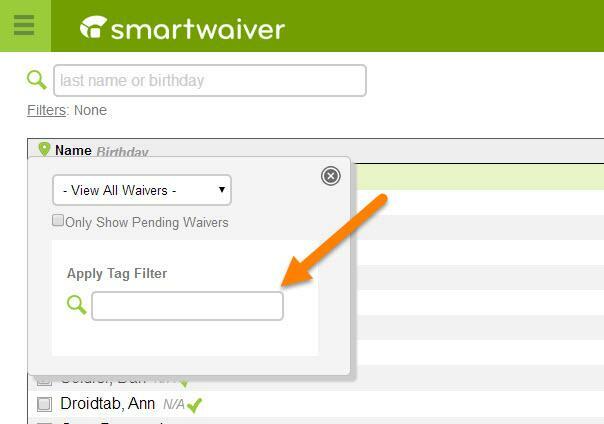 Tags are a way of categorizing signed waivers and participants in your Waiver Console and exported waiver data. For example, if you manage a ski resort, you may want to know which of your customers are participating in "skiing" and which are participating in "sledding". On your waiver you would simply create a dropdown question: "Which activity are you participating in?". 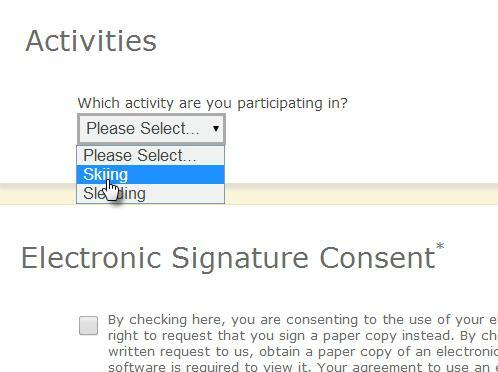 If they answer "skiing" that tag would then appear in your Waiver Console. 1. Click on Create/Edit Waivers from your account to get to the Waiver Editor. Click on the Waiver Fields tab and then Custom Waiver Fields. 2. Click on the New Section button and enter a section title (e.g., Activities). 3. Click on the New Question button, select a question type (e.g., Dropdown), and then customize your question. 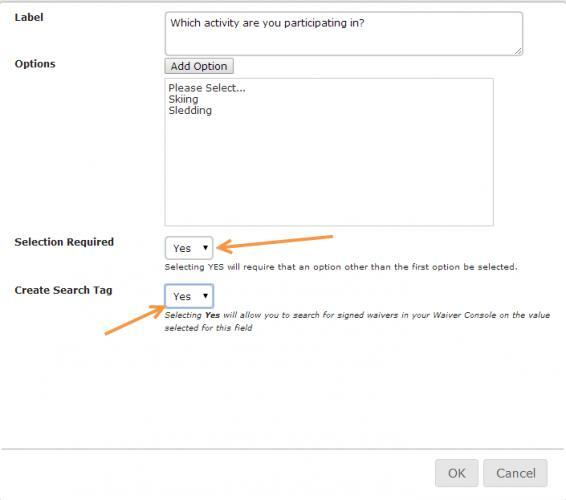 Next, select Yes for the fields: Selection Required and Create Search Tag. 5. Now, from your waiver, participants will be required to fill out your custom question. In your Waiver Console, you will see the 'Tagged' question next to the participant's name. To search for all of the waivers with that Tag, simply click on the Filters link and type in the Tag. You can also add a Tag after the participant has completed your waiver. Learn how. How do I add participant level questions?